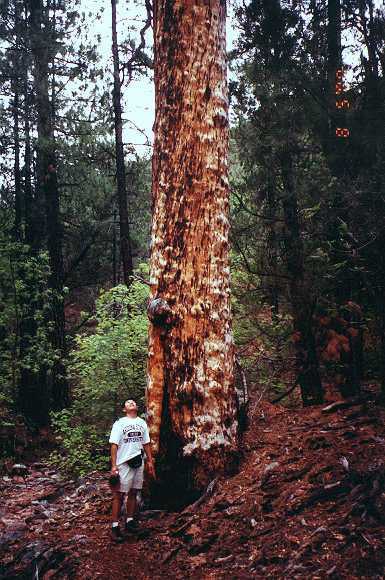 The Mogollon Rim (pronounced MOG-ee-yon) is a high plateau area in central eastern Arizona. 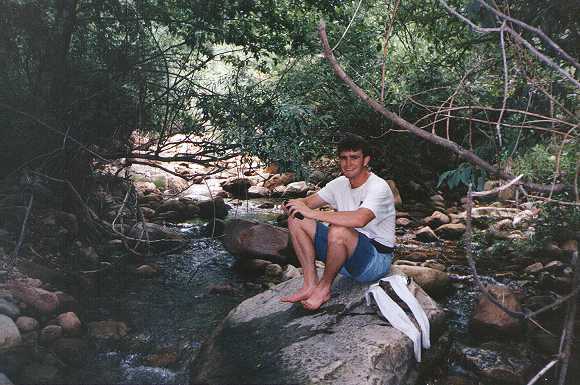 It offers a great deal in hiking, scenery, fishing, forest areas, and cool weather. Many Phoenicians go to "the Rim" to escape the desert heat in the summer. We've hiked several trails in the area and visited some cool landmarks such as the Tonto Natural Bridge near Payson. Other places of interest in the area are Christopher Creek, Pine and Strawberry. 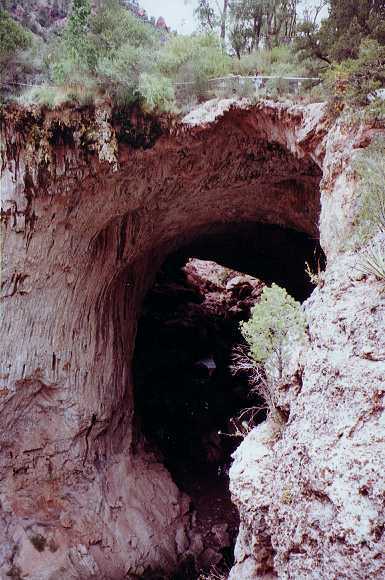 This is the Tonto Natural Bridge near Payson. It's the world's largest travertine bridge (whatever that means). It measures 183 feet tall, and has a 400-foot tunnel underneath. You can walk across the top, and hike to the bottom, and go through it and out the other side. There are some scenic canyons in and around the Bridge. 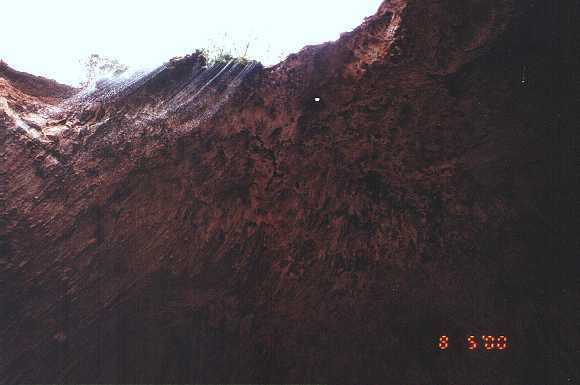 This is looking up at the top of the bridge from Pine Creek at the bottom. You can see a thin sheet of water cascading down from the top. You can also see a tiny hole in the ceiling of the bridge. The walkway on top goes right by the hole, and you can look down into it. Pretty cool. 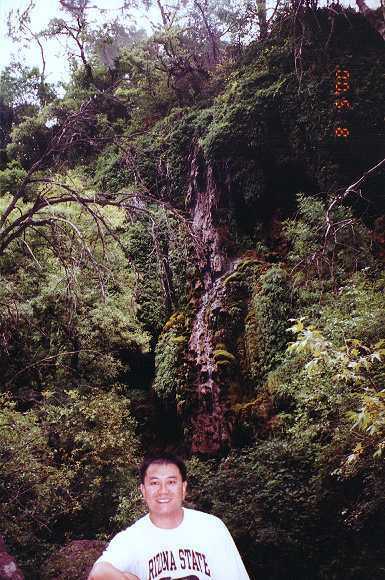 A trickling waterfall near the Natural Bridge. This a picture of Oak Springs. Yes, it is a spring, but more appropriately a soggy wet patch of grass. 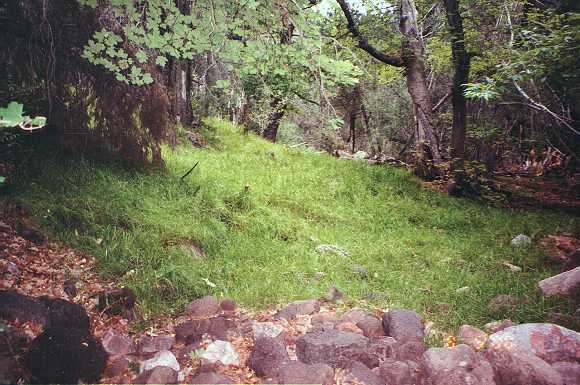 It's found about half way along the Oak Springs Trail that connects the Pine Trailhead with Hardscrabble Road. The trail runs through a woody area with plenty of shade and not a lot of foot traffic. Very tranquil. Me next to a huge victim of lightning along the Oak Springs Trail. Utah Gannon, a friend of ours from my GM days. This was taken in the Christopher Creek area. The water was just too inviting. He had to dip his feet in. Sheila, Mayrie, and Hector on the same hike to Christopher Creek. 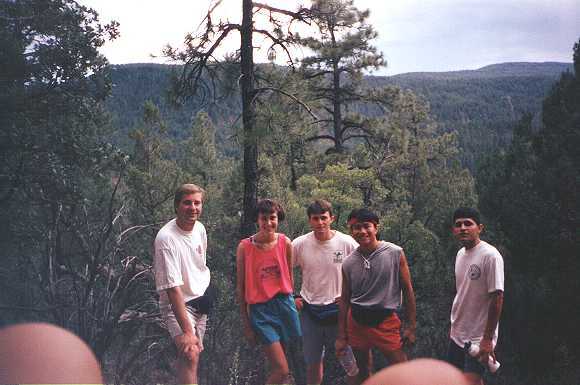 A group photo with the Rim in the background. Nice fingers around the lens! Anyway, there's Chris, Mayrie, Utah, me, and Hector.